You know, I'm getting sick and tired of seeing my own blood. Really, enough now. No, this is not what I intended. 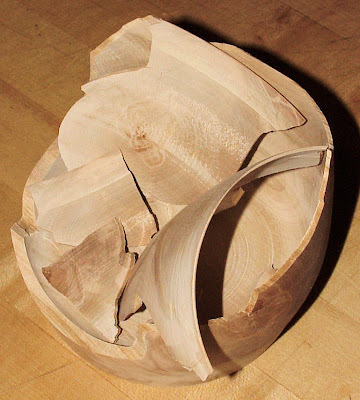 This is, was, an eggshell turning. When finished (never! ), the walls of the bowl should be no thicker than 1.5mm, thin enough that light shines though. This is quite difficult. I had the upper portions of the wall turned to about 3mm thickness and was slowly thinning down the bottom portion. I reached inside the bowl while it was turning to smooth the inside wall with a piece of sandpaper, so that I could get a good caliper reading on it, and BOOM! Pieces everywhere. Razor sharp pieces. Flying shards sliced three deep parallel cuts across the first three fingers and thumb of my right hand. If you're going to injure yourself repeatedly, keep it bilaterally symmetrical I say. Should you ever decide to take up wood turning, remember one of the best things you can invest in is a quality full-face shield. Just saying. Oh, and get a good First Aid kit. MWT, it's gotta be, what? 3AM where you are. What are you doing up? Lack of sleep make Marine Scientist soggy and hard to light. Go to bed. I worry about carpal tunnel and RMCS (Repetitive Mouse Click Syndrome). I usually only take pain medicine for stress headaches. Ouch. Yep, a first aid kit works for everybody. So does knowing how to apply a tourniquet properly. I think the universe is trying to tell you to do something else for a little bit, Jim. I'm afraid I agree with Steve on this one. JIM, STEP AWAY FROM THE SHOP! Never! I will be turning today! Uh, if I can bend my fingers. Actually, exploding bowls are common, especially when you're turning eggshell thin walls. What irks me with this one, is that I was this close to finishing it. Bloons, I just learned a new word. You online gamers are a strange bunch MWT, a strange bunch. Actually, you can blame that one on Scalzi (must be "Blame Scalzi Day"), who wrote about it in his By The Way blog a few weeks back. Sorry to hear about the demise of your bowl, glad to hear it wasn't a once-in-a-lifetime catastrophe. Can it still be turned into a dish or somesuch? So sorry to see "Bowl Deconstructed". :( More like "Bowl Exploded." I still haven't found all of it. MWT, with eggshell turning this happens more often than not with some turners, though I have a pretty good ratio of exploded to non-exploded. Sometimes you can salvage the base, but most of the time it's not worth it. I could probably make a small dish from what's left of this one, but there's nothing interesting about the wood in the base. All the really interesting figure, and thus the stuff that makes it art rather than just a hunk of wood, is in those little raggedy pieces you see in the picture. I've already tossed the pieces into the burn barrel. I turned a new one today, and cut blanks for tomorrow. I’m glad that was Melissa’s Christmas present and not mine.